It was not so much about the performance but getting back to winning ways was that mattered. Not quite back to their best but Banbury came away with a well deserved South Premier Hockey League three points from their trip to Winchester. Banbury moved up to sixth in division one on goal difference with five other teams following Saturday’s 2-1 success. Banbury welcomed Steve Hicks back in goal as regular keeper Fergus Dunleavy recovers from shoulder surgery, making his first league appearance for six years. Hicks kept the scores level with a terrific save within the first two minutes. Moments later Josh Nunneley sent an aerial pass half the length of the pitch to find George Brooker whose cross almost helped open the scoring for the visitors. But it was the home side who broke the deadlock midway through the first half when they were awarded a penalty corner on one of their rare visits into the Banbury half. Mikah Smithard slammed his shot home to give the home side a short-lived lead as Banbury were immediately on to the front foot and converted their sustained pressure into the award of a penalty corner of their own. 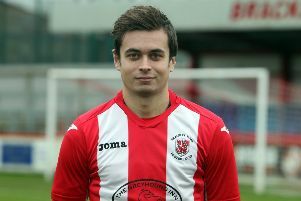 Despite missing the last two games, Steve O’Connor completed a training ground move from short range to level matters. Banbury rekindled the spirit of last week’s second half performance against leaders Old Cranleighans, storming back to create a host of chances as Tyson Nunneley, Brooker and O’Connor operated down the right while Jonny Stirrup and Rhys Potter combined down the left. But as the half wore on none of the visitors’ chances were converted and Winchester continued to threaten with counter-attacks, one of which brought an outstanding sliding save at the top of the D from Hicks as he thwarted a two-on-one opportunity for the home side. Sustained pressure from Banbury eventually paid off with only eight minutes to go when Simon Boardman cracked home a long range shot. The visitors created further chances in the remaining minutes but could not add to their tally.